"Purple Sunset" has been selected for the "Quilts=Art=Quilts" exhibition, the 29th annual juried quilt show at the Schweinfurth Memorial Art Center in Auburn, NY. 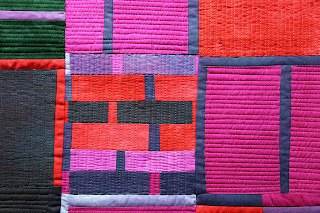 This year's exhibition will feature 90 quilts by 67 artists. The jurors, Rosalie Dace, Kerr Grabowski and Margo Mensing, chose from 360 entries by 206 quilters. The show runs from November 1 to January 10, with a preview reception on Saturday, October 31, from 6 to 8 pm. 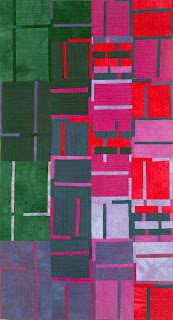 "Purple Sunset" is machine-pieced and machine-quilted hand-dyed cotton fabrics. It is 50"h X 27"w and was completed in 2009. I love your color palette! Congratulations on your being selected in this excellent exhibition.